Basically, where there's a Will there's not always a Win. So, Arcade Fire's Will Butler just announced the release of his new album 'Policy' and you can listen to single 'Take My Side' right now. But despite the band's huge popularity, it seems that Twitter still hasn't quite got the hang of their Arcade Fire A-Z, and are confusing Will Butler with the band's lead singer, Win Butler. And it's not just fans either, so major news outlets also seem confused. Here's just a couple of the accounts that are producing major retweets right now. 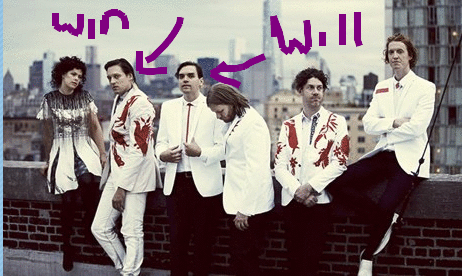 People even think Win Butler changed his name to Will Butler. And someone thought Win Butler just had a new 'Policy' about band members making albums. Sigh. Its not quite #whothef*ckarearcadefire but it's pretty much there. Watch the promo for WILL'S new album now.